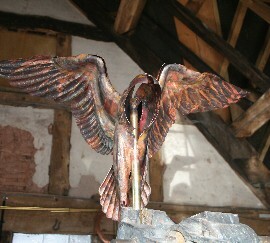 The Hovering Barn Owl should be in the bath by the evening, with only the claws to complete today. It is balmy here in Herefordshire, so the doors are wide open, and the wasps are making slow circuits in and out. The Labrador is soaking up the rays. Even the cows are quiet (having spent the last three days bellowing). Went to the Courtyard theatre last night with my two oldest boys (teenagers) to see Peter Shaffer's Equus. I am not sure they could quite believe their eyes when the actors got naked! The scene where the horses were blinded was quite jarring; I felt like I needed a little cry afterwards, but very enjoyable. The set was quite simple with six mounted horse heads in a semi-circle, looking down on the play, which took place in a sort of small golden circle. We the audience completed the feeling of "amphitheatre", as the actors themselves sat/stood watching the play unfold. There was a real sense of the horses ominous presence, bearing witness to the story. The heads were quite skeletal/mechanical, Grecian, stylized, and were in turn worn by the actors. It's always interesting to compare ideas like this with our own Horse Head Sculpture. I used to paint sets for a theatre company on Martha's Vineyard, the Vineyard Playhouse. This was just after graduating from art school, and I must have been holding down 3 jobs at the time (the days when sleep seemed optional). I remember Lettuce & Lovage, also by Sir Peter Shaffer. It was the first production I worked on. But my favourite was painting the background to Brian Friel's Dancing at Lughnasa...it was a huge endeavor; an enormous painting of the Irish countryside across the whole of the stage. Completed in a single night's work! We had a huge troop of volunteers on board, but none of us had any training in painting sets. Seems crazy now, looking back. I think I would enjoy working in theatre again. We used the open studio event h.Art, to show-off our new gallery space, which finally has light thanks to a restored mill window from Leominster Reclamation. Removing a section of the second floor has created a sublime space to be in. Lucky weathervanes! Heat is the hot topic this month, with winter just around the corner & the wood stove still "homeless". We are eyeing the tin-store as a winter studio option (I think the word the Duchy used to describe it was "condemned"). It needs SO much work (who's idea was it to move into this enormous can-of-worms of a property?!). The September workshop was a bit terrifying, but a great success. Advertised as a one-day introduction to Metalsmithing, it took students through the full range of our processes. A lot to teach in a single day. I could be heard pushing everyone to "hit it harder" & "really whack it"...wonder what the h.Art visitors in the gallery thought was going on up there! Everyone seemed to enjoy themselves, though; lots of laughter & coffee and we had a great smorgasbord of a lunch. Most importantly the work produced was delightful, and everyone wants to come back for more. Watch this space for dates and times. So what's on the workbench you might ask (the hints in the title of the blog)? 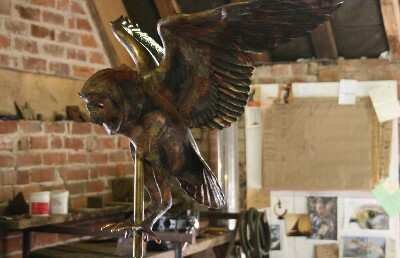 We are on the finishing stretch of a hovering Barn Owl weathervane (he's waiting for his face & talons). 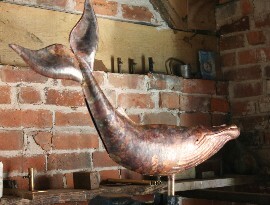 And one of our personal favorites from our original numbered series, the Humpback Whale weathervane, is taking shape. 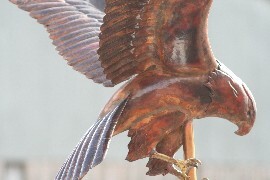 The Montagu's Harrier Hawk weathervane, which was the star of the show at Art in Action (Waterperry House, Oxfordshire) back in July is now on our website on our new-look Sale pages. And lastly, we finally received our copy of the Magazine Antiques (July/August issue) with the article about the American Museum in Britain. There's a fabulous picture of our Lady Liberty Weathervane in the gallery (with it striking "Pompeian red" walls), and all the background to the commission is explained. As it's written by the Museum's curator Laura Beresford, she explains how she found us at Art in Action last year :"...drawn to their tent by the soundscape of hammers colliding with metal sheeting and Karen's mellifluous American accent. A good fairy guided my festival-weary feet that day"...mellifluous? I thought I was just loud!